Tactical flashlights are indespensible everyday carry, and can be used in many helpful scenarios. But finding the perfect flashlight can be a minefield, considering all of the choices out there. We've broken down the best tactical flashlights based on factors like durability, price, brightness and other features. Big value for the money, this tactical flashlight boasts a powerful beam, incredibly durable body and is lightweight enough that it won't be noticed with everyday carry. Anker gives us an inexpensive, rechargeable flashlight that can withstand the elements with superior lighting capabilities. What makes a flashlight "tactical"? What can I use a tactical flashlight for? What is the brightest tactical flashlight? The most affordable tactical flashlight? Can you use a tactical flashlight as a weapon? Streamlight ProTac 2L-X gets our nod for best tactical flashlight mainly because it's slightly more versatile than other tactical flashlights on this list. Sure, other flashlights might have better beams, higher lumen output or higher grade materials, but the Streamlight ProTac 2L-X is the best combination of the above factors. Don't kid yourself into thinking that the ProTac 2L-X doesn't have the power or durability you need in a flashlight. The light itself comes with a high IPX7 waterproof rating (1 meter depth for 30 minutes) durability rating with a strike bezel. Read our full review of the Streamlight ProTac here. The Anker AK-T1420011 Tactical Flashlight is easily one of the top flashlights on this list. It's very inexpensive, coming in at under $30. The amount of features that you get for the money is quite impressive, which is what gives this flashlight it's Honorable Mention distinction. The light is equipped with a 900 lumens CREE LED that has 5 different modes: High, Medium, Low, SOS and Strobe, all with an adjustable focus. The light can illuminate over two football fields in length, making it one of the more powerful flashlights on this list. The 5 different modes are versatile, though, which is what makes this flashlight a steller choice for camping or other outdoor adventures. The Cree LED XM-L2 chip used to power the light will provide 50,000 hours of intense brightness. The LC90's chip also ensures that the battery won't under charge, over charge, overheat, or suffer wear and tear. The flashlight comes equipped with a 3350 mAh rechargeable battery, as well as a micro USB cable that allows you to recharge the battery by plugging straight into the flashlight. The all-metal body is tough and tested, with an IP65 water resistant rating, and the aluminum body is shock-resistant. It's completed with an anti-slip finish that keeps the light in your hands. The flashlight is also built to withstand extreme cold, and will keep shining in temperatures up to 14 F.
Anker provides an 18-month "worry" warranty isn't as comprehensive as other brand's lifetime warranties, but it's still better than no warranty. What's interesting about the Fenix PD35 TAC is that it is nearly twice as bright as the above ProTac 2L-X, boasting 1,000 lumens of light output. This is too much light output for most normal usage, but it is quite handy for outdoor enthusiasts who need light during the night or wee morning hours. Using that 1,000 lumens indoors is just too bright and won't help much. But you'll be hard-pressed to find a light that puts out this much light for the price. The light has two modes: tactical and outdoor. The Tactical mode has three different settings: Turbo (1,000 lumens), Low (60 lumens), and Strobe (1,000) lumens. The Outdoor mode has six different settings; the three in the Tactical mode plus a High (500 lumens), Mid (200 lumens) and Eco (8 lumens). The variety of modes means that you can use the flashlight for something as intense as police work, or something as simple as camping. The tactical flashlight comes with two rechargeable EdisonBright CR123A lithium batteries, which is very handy. You can also use one rechargeable 18650 Li-ion battery as well. The Fenix offers reverse-polarity protection, which means the light won't fry if you put the batteries in backwards. This is a smart, behind-the-scenes feature that you don't know you need until you need it. Each flashlight has slight variations. For example, the CombatLight version only outputs 320 lumens on high mode, and the other three output 600 lumens on high. The Law Enforcement flavor starts on low beam when turned on, while the rest start on high. The CombatLight also has a different grip than the other three. Be sure to research each version to see the differences. No matter which tactical flashlight you get in the G2X series, you're going to get great value. The beam on the SureFire is a thing of beauty, as it outputs light with a precision reflector to optimize the beam and give plenty of surrounding and focused light. The LED emitters are high-efficiency and essentially indestructible. The body is made up of Nitrolon polymer and mil-spec hard anodized bezel that makes the flashlight incredibaly durable. The back features a tailcap switch that serves as the function for the flashlight, switching from low to high. The body is ergonomically shaped, fitting the hand nicely. The flashlights come with two SureFire 123A lithium batteries, and they're also quite stout. The batteries feature a 10-year shelf life, wide temperature tolerance for nearly any condition, with built-in short circuit protection. The J5 Tactical Hyper V is a very nice budget pick for a tactical flashlight. While other tactical flashlights might be multiples of the price of the J5, this little torch packs a pop. For starters, the light has 400 lumens of LED light that on a low setting can run all night on 3 AAA batteries. Not needing special sizes of batteries makes this flashlight very convenient. The J5 can sweep an area the size of 600 feet on a clear night, and can provide a couple of hours of continous use on a set of batteries while used on high. The case is made from compact aluminium alloy that can be dropped from up to 9 feet and briefly submerged in water. The flashlight is small and compact, weighing 2.4 ounces and measuring only 5 inches in length. The J5 features 3 modes--High, Low and Strobe--and the light can also zoom from wide to narrow in the range of light. Because the price point is pretty low (around $20), you can keep a couple of these wherever you need them: in the backpack, with the camping gear, in the glove compartment, etc. Perfect for everyday carry. SOG is known for other gear like pocketknives, but did you know that they make a killer tactical flashlight as well? The DarkEnergy 750-lumen flashlight is a beast that can set the forrest ablaze while camping, hiking, or otherwise. The full 750 lumens is one of the highest you'll find for a flashlight that is only 6 inches in length and weighing only 6 ounces. The body of the Olight S1R is made with 6061-T6 aluminum and has a anti-scratch type III hard anodized finish to ensure that the hard usage on the light won't show up on the outside of the flashlight. The beam is balanced, and features 5 brightness levels from 0.5 to 900 lumens, making this a very versatile flashlight. The flashlight has a flat tailcap, with the on/off switch on the side of the flashlight. This means that you can lie it flat on it's back for hands-free use. The MagLite brand is an iconic tactical flashlight brand, and for good reason: they pay attention to the details. The MagLite Mag-Tac is no exception to this rule, designed with features geared specifically towards military, emergency responders and police force. For starters, the flashlight is built "tough enough to last a lifetime", and built in the USA. The body has an aggressive knurled design, stealth matte finish, with weather-resistant seals. The Mag-Tac is water resistant (IPX4) and drop-resistant up to one meter. Turning on the flashlight happens with the Quick-Click selector found on the tail cap of the baton, and has three different light modes. The light comes with two CR123 lithium batteries that last up to 4 hours of continuous use on full strength. The light can cast a beam of up to 193 meters. The iconic gun manufacturers Smith & Wesson have tried their hand at making a tactical flashlight, and the result is a solid flashlight that can be used in nearly any situation. For starters, the flashlight outputs a very high 875 lumens in three different modes (High, Low and Strobe). The body is constructed from aerospace grade aluminium, and can be dropped a meter from the ground. The body is double-O ring sealed for waterproofing. The glass used in the lens is shatterproof tempered with a anti-reflective coating. The flashlight does have the on/off button located on the tail cap, but a nice feature Smith & Wesson have added is recessed anti-roll compontent to the tail cap. The flashlight can be mounted, and includes a pocket clip, holster, lanyard, and two CR123 batteries. Pelican may not be as popular as some of the other choices in this list, but their rechargeable tactical flashlight is definitely worthy to be included on this list. The light features a 695 lumen light with three different modes: High, Medium and Low. The battery time is solid with each mode, and able to last over 9 hours of continous use on low. The run time doesn't matter so much because the flashlight comes with a rechargeable lithium ion battery that can connect to a the base of the battery with a standard USB cord. The flashlight features a battery level indicator light. The Pelican 7100 is has a waterproof rating of IPX7, and the body is constructed from anodized aluminum. Maybe the best thing about the Pelican brand is their lifetime guarantee: you break it, they'll replace it forever. The PeakPlus Super Bright Tactical Flashlight is a nice budget option for those wanting to get the most lumens for your buck. This flashlight has great value for what you get, clocking in at under $20. The light itself is high-quality LED that can cast a beam of 600 feet, with an adjustable focus that can zoom or widen the viewing area. It has 5 different light modes of full, medium and and low brightness, as well as a strobe and SOS function. The flashlight is powered by either 3 AAA batteries or a single 18650 rechargeable lithium ion battery. The body is water resistant, anti-abrasive and heavy duty, making this a nice addition to your camping or hiking gear. The Eastshine T25 is a sturdy, solid flashlight that ticks all the boxes for an everyday carry tactical flashlight. The body is constructed from aero grade aluminum alloy with a HAIII military grade hard-anodized finished that protects from drops and strikes. The flashlight has an advanced temperature regulation technology that keeps the flashlight from overheating, and is impact resistant of up to 1.5 meters. The beam features a toughened ultra-clear mineral glass with anti-reflective coating that keeps the light bright. The maxiumum output for the flashlight is a high 1,000 lumens, and the light can run for almost 22 days straight on low level. The best thing about the GearLight S1000 flashlight is how inexpensive it is. You can get a pair of these flashlights for under $20, which makes them a perfect option for tossing into your glovebox or camping bag without worrying about breaking an expensive flashlight. The GearLight Tactical Flashlight has a great mix of features for the price. They don’t advertise the lumen rating for the flashlight, but it is very powerful, and has five different modes of operation (High, Medium, Low, Stobe, SOS). The beam has an adjustable focus as well. The body of the flashlight is small and weighs only 5 ounces, and is constructed of military-grade aluminum. The flashlight can be powered by 3 AAA batteries or a single 18650 rechargeable battery. The flashlight doesn’t have an IPx rating, but it does claim to be water-resistant and drop resistant. I would never submerge this flashlight under water, but getting the exterior wet with rain or some dampness shouldn’t be an issue. If I were someone who needed to rely on my flashlight for life-or-death situations, I don’t think I would buy the GearLight. But for someone using the flashlight around the house, walking the dog, or some other outdoor activity, the GearLight Tactical Flashlight S1000 is a fine option for the price. 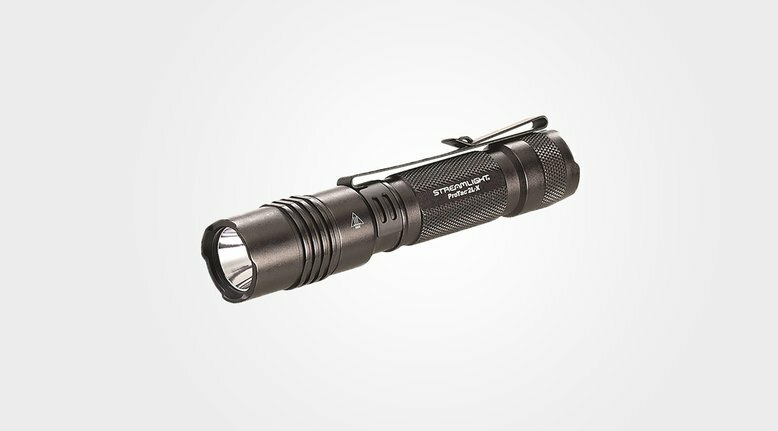 The ThruNite Ti3 is much, much smaller than the rest of the flashlights on this list. At just 2.8 inches long and a half an inch wide, this microlight is a little light powerhouse. The body is made from type III hard anodized aluminum. The light puts out 120 lumens, and has 4 different modes of operation: High, Low, Strobe, and Firefly. The beam is powered by a single AAA battery, and uses a CREE XP-G2 R5 LED. The flashlight has different memory modes that allow you to switch the flashlight back on in the previous setting as opposed to the default low light. The microlight has a clip attachment that can be reversed to attach to a hat brim. The ThruNite can be attached to a key ring, and it all comes with a nice 2-year manufacturer’s warranty. What makes a flashlight a ‘tactical flashlight’? The term “tactical flashlight” is fairly open-ended. Some flashlight manufacturers use it as a marketing tool, to simply convey that their flashlight is rugged. Others believe that a tactical flashlight is one that can be mounted to a gun or helmet. Oftentimes “tactical flashlight” is used to describe a type of rugged flashlight that military, police, fire and other security professionals depend on to do their job. They aren’t looking for a flashlight that may or may not work, but one that will consistently light under many conditions. While the term is vague, here are some characteristics and features that are often seen on a tactical flashlight. High lumen rating. Many of the torches on this list are rated above 500 lumens, which is very bright. With the use of sophisticated LEDs, the light seems even brighter as it can be focused. Durable. Tactical flashlights are made from durable materials that help with protecting the light in the event of impact or inclement weather. The bases of the lights are often coated with anodizing, and many of the best flashlights come with warranties. The idea is that the flashlights can withstand nearly any climate or condition over time. Waterproof. Many of the flashlights we’ve listed come with an IP ratings of 4, and some go up to 8. An IPx4 rating means that the flashlight can be splashed, and an IPx8 ratings mean that the flashlight can be immersed in water a meter in depth or more for 30 minutes. Shock-resistant. It’s helpful for flashlights to be shock-resistant, not only for durability of the device over a lifetime, but also in case it’s dropped or needed to be used as a combative weapon. Multiple light modes. Most of these tactical flashlights have multiple light modes that allow for different function. These light modes often include High, Medium and Low levels of light output, as well as SOS and strobe functions for emergency situations. Sometimes only a tiny amount of light is needed for reading or other mundane camping, for example. Other times you’ll want to put the flashlight on full power, which some flashlights can illuminate up to 2 football fields in length. At the time of this writing, the brightest flashlight we know if is the IMALENT DX80 which has a 32,000 lumen rating. This monster has an IPx8 waterproof rating—submersible up to 2 meters. The DX80 is also impact-resistant up to 1.5 meters, and runs off of a rechargeable battery. If you’re looking for sheer brightness, the IMALENT DX80 is your pick. 3,200 lumens is a lot of light for one flashlight. What is the best waterproof flashlight? If you’re needing a flashlight that can operate at depths of water, consider this professional diving flashlight on Amazon. It’s not built to the same durable standards as other other tactical flashlights that we’ve reviewed, but it will still operate under up to 80 feet of water. If you’re looking for the best waterproof tactical flashlight, then we recommend the Streamlight ProTac 2L-X, which has IP rating of 7 and is able to withstand water submersion up to a meter in depth for 30 minutes, plus it’s a durable flashlight that’s built to last. The flashlight can be submerged up to 80 feet of water. What is the most affordable tactical flashlight? Flashlights are just like any other product in that you can spend very little on a “tactical” flashlight. The problem is that when you sacrifice cost, you (usually) sacrifice quality. So with that in mind, we believe the cheapest tactical flashlight that isn’t a total piece of junk is the J5 Tactical V1-Pro. This little light has 300 lumens of power, and is advertised to be able to withstand being run over by a truck, and can be “stuck in a freezer”. While there is no official IP rating for either water or shock-resistance, there are plenty of reviews that say this flashlight is a great option. If you still need convincing, the J5 Tactical V1-Pro comes with a one-year no-questions-asked warranty. The flashlight currently costs under $15, which makes it one of the most affordable tactical flashlights. Less than $15 dollars and lots of power. What’s the best flashlight for emergency situations? It’s hard to label a flashlight as the “best” when it comes to emergency situations. Does it need to be super bright to find your way if you’re lost? Does it need to be waterproof in case you’re stranded in a flood camping? It’s hard to know what feature you’ll need in an emergency scenario. 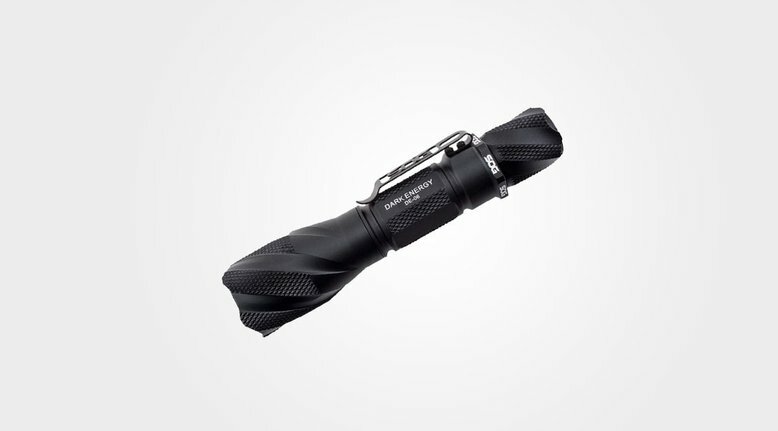 If you’re looking for a flashlight to keep in your glove compartment or hiking pack, then we’d recommend the GearLight S1000 Tactical Flashlight. These little torches are small, waterproof, and have emergency lighting modes of Strobe and SOS. They’re virtually indestructible, with the manufacturers claiming they can be run over by a car and still function properly. And the best part: you can grab a pair for under $20. Comes with 2 in a pack for under $20. Small and rugged, with 1,000 lumens of light. What’s the best survival flashlight? Let’s assume an emergency scenario where you don’t have access to any power and need to have a flashlight that will keep you safe. This is where having a tactical flashlight that can be powered by a hand crank comes in very handy. The LifeLight Emergency Flashlight is a nice choice, as the powerful battery is powered by a hand crank. The flashlight is shock-resistant, and can also charge any USB-powered device like a phone with the hand crank. The LifeLight also has a compass and seatbelt cutter, as well as a mini hammer. A handcrank on the flashlight means we don't need no stinkin' batteries. What is the best rechargeable tactical flashlight? Being able to plug a flashlight directly into a power source is incredibly useful. Not only do you save money by not needing to buy new batteries, but it’s also easier to plug in the flashlight to the charger when it’s convenient for you. If you’re going to be using the flashlight frequently, recharging is a very helpful feature. The best rechargeable flashlight we’ve reviewed is the Anker Bolder LC90, that allows you to plug straight into the flashlight body with a micro USB cable. It’s also fairly inexpensive and comes with an 18-month worry free warranty. Recharge straight into the body with a USB cable. Can you use a tactical flashlight as a weapon or self defense? Technically, you can use some tactical flashlights as a combat weapon. Many of the above flashlights are made from hardened metal alloys and have been rated to be shock resistant. So if you needed to use the flashlight as a bludgeon or a club, it might work in a pinch. That said, your best bet is to use a tactical flashlight in a combat scenario as a tool to blind the assailant. Many of these flashlights are very bright, some over 3,000 lumens.